As I have been undergoing massive shifts and ascension during this past Aries cycle of Karmic cleansing along with all of you, I have been guided to take some very radical and swift decisions regarding detachment that I wanted to share with you all. This last cycle of the “Aries Fire,”was a massive cleansing period of releasing and bringing to the surface all the shadow aspects still in need of purging within us. Aries is typically a harder cycle for most with the swift and erupt energies of fire it brings. I always flash back to when I was first learning this information in my non-traditional/traditional master’s program. I took a class with a wise academic woman who is still the most academically scholastic person I know on the subject of mysticism and religious studies. She spoke, read, and understood over five languages, had studied at all the top Universities in the country, and was a reservoir of knowledge. I remember her speaking about this “fiery” time of Aries and how this energy builds until the 19th of April when things start to explode. This seems to be a fact that remains true as we just witnessed last week with all the explosions, deaths, and violence that arose in fiery and disruptive ways. Aries is the epitome of masculine aggression that brings to the surface the collective “sickness” and shadowy parts that are in need of healing. This particular Aries cycle was vicious and strong as Mother Divine is cleansing all that needs to be cleansed before this summer when she starts to erupt. Those of us who are ready went through the last of the “karmic cleansing” and soul lessons. The energy was intense preparing us for the next leg in the journey. In the 5th dimension there is no “karma” so whatever we are needing to resolve or finish from Karma is coming up for us to re-examine, release, and let go of for good! This last month, I found my Self connecting to nature, detaching from the outer world, and going inward. It was a very self-reflective action with purpose oriented time for me to get clear on my own path and how I can be of service to humanity more. As I was meditating this morning, I realized how important detachment is on our paths at this stage in our evolution and wanted to share my Insights from Spirit on this important aspect of the journey. I have been reading for years about Buddha and his journey of ascension. If you read about his ascension process, it is very profound, and one of his main teachings out of suffering is to detach. Detachment is not saying you “don’t care” or that you “turn away” but you don’t feed into the energy. It is a process of allowing without expectation and holding your light no matter the circumstance! 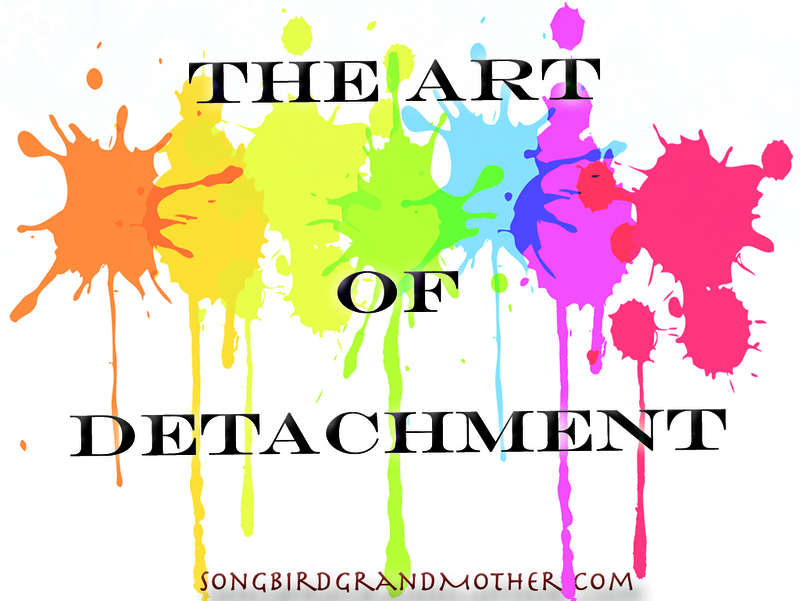 As we head into this powerful part of ascension we must learn and master the art of detachment. The ego feeds on drama and uses guilt, manipulation, and control as it’s grandest weapons to keep us in suffering. However, when we completely move from our “I AM” presence living in the moment as the moment comes, detaching from the drama our ego is forced to take a back seat and Spirit is in charge. The part of Self that knows all and is all and just is! During this process, I had to make massive decisions and eliminate any and all distractions. The idle chit-chat, the social events that felt heavy, the toxic people and things that drained me, and found my-egoic self at a loss. Instead of engaging into the everyday world and all it’s “drama” I was guided to move into nature and BE and accept my Self as the wise woman I truly am in every moment. To no longer separate my spiritual Self from my everyday self. Which I “thought” I had done the last 5 years on my path, but found as with all things on this path to mastery, that there is always more. I was guided to UTILIZE every moment of my existence in this place of presence. Just as Eckart Tolle or any of the ascended masters who came to serve the light completely, which is all of you reading this. I had to eliminate any and all need for “fun” as we know it and make every moment, every decision, every action FUN!!! This has been a very transformative time for me. I no longer resonate with the complaining, the past or future thinking, the material, or the need to “prove” myself to those who were only using my gifts for their own benefit as needed when needed with no reverence and/or respect. This is a very 3D limited way of seeing spirituality and us as lightworkers were conditioned into this system accepting this as our worth. As I ascended into this new vibration, I had to bypass all the fears of isolation, loneliness, abandonment, and rejection to get to the core essence of my true Spirit. To know and trust Spirit completely without any attachment to the critics, the naysayers, and as I detached, more drama tried to emerge. However, I detached more. Not feeding the drama, recognizing it, and allowing my Inner GPS to hold the light more. I realized that to be the Master I came to BE, I can no longer engage in or feed any energy that is not in alignment with my I AM presence. Which took me a little while to understand. I had to purge anything that was just “ok” to me. In times past, I would say “yes” to things, people, and situations at times that were just “ok.” They weren’t filled with joy, but I would do them out of this egoic need to “do something” or “have friends” or “people please.” Although I have been working on all those issues for years now, it was during this Aries fire that I was forced to make serious decisions and detach from anything that didn’t resonate with MY I AM presence. I had to understand that the Master lives, breathes, and IS the embodiment of Spirit in all that s/he does and is IN the world, but is not OF the world. Of course as you do take this step in eliminating all the toxicity the egos of others bring up all the resistance within you. The control, the manipulation, the guilt, shame, etc…start coming to the surface. I am in a fortunate place to be doing this work everyday and to have my antennae situated in such a way that I can hear the celestial realms of my Spiritual Helpers, which everyone can do, but it is a muscle that we must develop. But, the outside world of business, friends, family, and such doesn’t take to detachment too kindly yet. We are programmed to live an “ok” life and to make decisions out of fear or obligations going against our intuition. We’re afraid to disappoint or let others down. Instead of moving with our own I AM presence we invalidate ourselves, reduce ourselves, and then the ego says “I got you right where I want you.” I share all this with you In-Spirit as guided by Spirit to awaken you to this within your life. If you are reading this, take this as a guide map to detach from your own life. Detach from the drama, the ego’s, and the guilt, manipulation, shame, and control. Allow your I AM presence to move you where it desires to go. The places that bring you JOY and excitement! If it is just “ok” or you aren’t feeling the joy of elation, then meditate and detach from all the egoic trappings and allow your Spirit to lead the way. Moving forward into this New Era we must be filled with the light in all that we do. When we are guided, called, and filed with joy in thoughts, feelings, and actions we are moving from our I AM presence! It is not necessarily “easy” but I guarantee when you move from this place you will find the joy of your Inner child and live in more peace, presence, and abundance in all ways, shapes, and forms! Even mundane things like cooking, cleaning, dishes, etc… become passionate and filled with joy when we move from this place! Cheers to all of you doing the conscious work no matter the difficulty! I am right here with you! 5th dimension here we come as Masters of our own Being here to SHINE and show the way for others to SHINE as well! Thank you so much for being on the journey with me! I am so humbled and grateful to be living in this era with you and to be on the journey with you! Many Blessings of love and light!